Music and arts festival ONE Musicfest has announced the lineup for its 2018 festival. 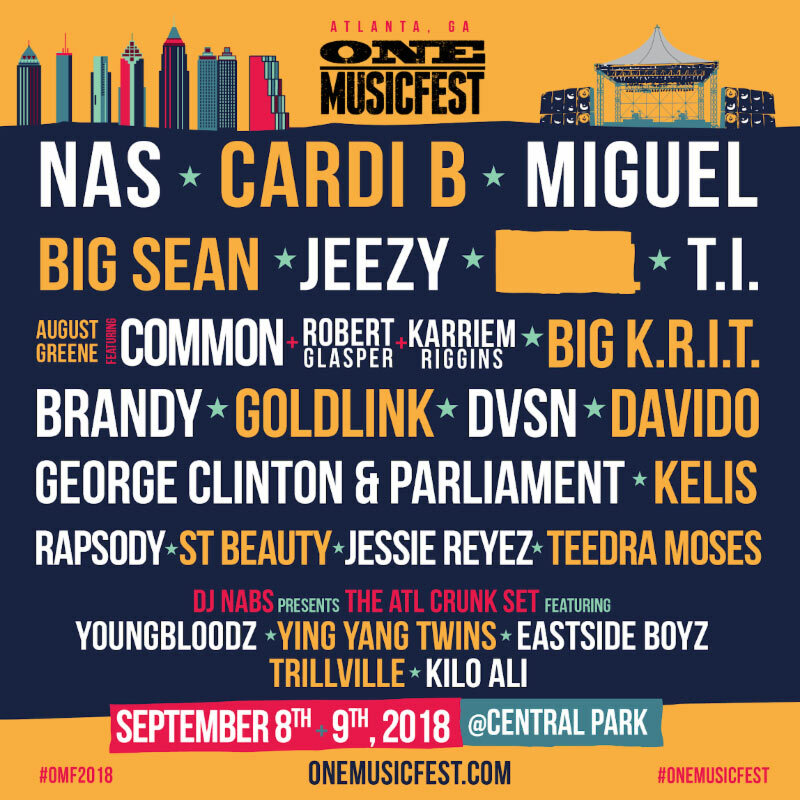 Now a two-day experience taking place Saturday, September 8 and Sunday, September 9 at Central Park in Atlanta, GA, ONE Musicfest will feature Nas, Cardi B, Miguel, T.I., Jeezy, Big Sean, Kelis, Brandy, August Greene, Big KRIT, George Clinton & Parliament and more. Hailed as one of the nation’s “Can’t Miss Festivals,” ONE Musicfest returns for its ninth year with an unforgettable weekend of high-energy performances and unique cultural experiences. Over 20,000 attended last year, generating over 1.8 billion impressions and rave reviews from USA Today, Associated Press, Huffington Post and VIBE. ONE Musicfest is the Southeast’s largest annual urban progressive music festival, featuring a diverse range of music, including classic and next generation hip-hop, soulful R&B, alternative, and rock. Founded in 2010, this year’s ONE Musicfest expects an attendance of 20,000 music lovers from throughout the country. For more information visit ONEMusicfest.com.